Lando had already made a positive impression on the nine-year-old Khari simply by being the first black character in the Star Wars saga. But he makes an equally negative one not two scenes later by turning our heroes over to the Empire. Nice try at assassinating the heavy of the Empire, Solo. But Vader SPITS on your blaster fire. SPITS, I SAY!!! But, we soon learn, Lando’s deal with the devil is, well, just that. Far from keeping the Empire out of Cloud City forever, as Lando hopes, Vader almost immediately threatens to renege on that condition. Vader turns Lando’s old friend over not to the Imperial justice system (as the law would presumably dictate) but to a bounty hunter in the employ of the galaxy’s most notorious gangster. Vader forces Lando to be a jailer of Solo’s companions — until Vader decides to imprison them himself later anyway. And, not least, he makes Lando a further accessory to the near-murder of Han Solo by carbon-freezing. The LIFE LESSON LEARNED FROM LANDO in this sequence of events rang clear to the viewing nine-year-old me: Don’t try to deal with the devil. Speaking of that carbon-freezing scene…early in this (protracted) series, I mentioned how I learned how much sound matters in film. A fascinating documentary about John Williams’ scoring of Empire underscores this reality. (Pun not intended.) Watch this link from about 5:50 to 8:20 and see the master at work on this pivotal scene of the film and hear how the music just makes it. I’ll wait. She loves him. And he knows it. Eventually, Lando realizes there’s absolutely nothing good about a deal with a guy who can and does change the rules whenever and however he likes, so he decides to change the game himself, no matter the personal cost. LIFE LESSON LEARNED FROM LANDO: It’s never too late to try to do the right thing. "No good deed goes unpunished" was almost the lesson I took from this. …the single most heartbreaking shot of the whole movie for me. In the background, Lando’s head sags under the weight of his compounded failures this day, and Leia can only watch in absolute despair as the man she’s come to love is rocketed off to captivity. And this time she knows it’s partly her own fault for slowing Lando’s plan just long enough to enable Boba’s clean getaway. The LIFE LESSON LEARNED FROM LANDO at age nine: Losing your temper can cost you more dearly than you can imagine. TRUST a brother sometime. The last lesson I learned from the First Black Man In Space is embodied in his announcement a couple of scenes later to the citizens of Cloud City. He warns everyone that the Empire’s taking over and that everyone should leave. Not only has he done all he can for them in light of the overwhelming power of Vader and the Empire, but he’s also shrewdly generated a chaotic situation to help himself and his new allies escape. LIFE LESSON LEARNED FROM LANDO: Have an exit plan, even if you have to make it up on the fly. Make sure you leave with something…but always leave responsibly. Now we’re on the final stretch of this retrospective. Be here in a couple of days for the first of the lessons I learned from the climactic duel between Good and Evil. As the final act of this seminal movie began, it had one more surprise in store: Lando Calrissian, the First Black Man in Space Opera, played by Billy Dee Williams. Wouldn’t you know, though: the first black man we see in Star Wars is, initially, an ANGRY black man. How stereotypical is THAT? Of course, Lando’s anger turns out to simply be ruse to play a joke on his old friend (and, as it happens, only the first ruse of many). That cape's so stylish yet manly. He was successful. No angry thug here; Lando was witty, smart and sophisticated. The wonderful thing about the casting of Williams for this part was that nothing about Lando says he needed to be black. He wore a cape and wore it well. I hated when he lost the cape later. He was slick and resourceful. He came through in the clutch when it counted. He was a womanizer. He was constantly trying to steal Han’s girl! He was a betrayer. This, of course, was the big thing. He sold out his old friend to Darth Vader to save his own skin! Hey. That's not Sidney Poitier! After the powerful lessons in loyalty that Han Solo demonstrated earlier in the film (discussed in part 3), this event really earned Lando my hatred. It was quite uncomfortable hating the first Star Wars character who actually looked like me. But this and subsequent scenes began to reveal a powerful life lesson embodied in the character of Lando Calrissian: People, things and circumstances are rarely what they seem on the surface. Look deeper. Next: What I REALLY learned from watching the First Black Man in Space Opera. Hope you’ll join me for another trip down memory lane. After reading my last fairly titanic musings on the dimunitive Yoda, I’ve decided to start doing much shorter but more regular updates to this trip down memory lane. I love how right after Luke gets a dire premonition about his friends going to a city in the clouds, we see…a city in the clouds. No beating around the bush in this flick! This is the indelible image I recall. For a city dwarfed by the cloudscape a shot earlier, it sure was a lot bigger up close. The lasting impression of this scene, though, didn’t fully manifest until a few weeks after I’d seen the movie. Our family was visiting South DeKalb Mall for dinner (probably Picadilly’s) near dusk, and I remember marveling at a sunset that completely looked like it could’ve been from that long-ago planet in a galaxy far, far away. It was also the first time I considered that the sunsets in the movie were, in fact, just everyday sunsets of my own planet in this galaxy. LIFE LESSON: Sunsets and sunrises are awesome. Next time: The First Black Man In Space. Life lessons from The Empire Strikes Back [part 6]: The Jedi Master. "Full of wisdom for a Muppet am I." As I wrote last time around, there was a wealth of wisdom for the nine-year-old me from this segment of this, the greatest movie sequel ever made. And there’s hardly another scene that had as much impact, both immediate and delayed, than the one the following quote comes from. Luke has a fixed idea of reality and what’s possible, while Yoda urges the youth to expand his horizons. While this has a concrete application in the Star Wars universe — raising Luke’s many-tons-heavy X-Wing fighter out of the swamp — it’s equally applicable in the real world. How often have we judged something too difficult or frightening or danagerous to attempt and thus made certain our failure by our inaction? How many of us fellas have decided not to talk to that beautiful woman because she couldn’t possibly be interested in us? Or not written that business plan we’re passionate about because we just know it’ll fail? What makes that beautiful woman any different from the less-dazzling one you don’t have any trouble relating to? Only you and your attitude about her. She’s just another person, with her own hopes, fears and opinions. What makes your business idea any less workable than your current 9-to-5 job? Only you and your attitude toward it. If it’s built on a solid system, you can work it — if you really want to. LIFE LESSON: “Unlearn” what you “know” to be your limits and be open to the possibility of growth and unexpected successes. Yoda’s powerful demonstration of lifting the huge X-Wing from the swamp with mere concentration does little to sway us from this conclusion. That’s a fantasy, where stuff like that is possible. In real life, all you can do is try, right? That’s because we, like Luke, are misunderstanding Yoda. The Jedi Master is pressing for Luke’s DECISION and DETERMINATION to do his utmost. To simply “try” is to expect to fail. Yoda speaks in his absolutist manner because he’s not asking Luke to do anything that is not well within Luke’s power. Unfortunately, Luke doesn’t yet accept this truth and so can only commit to “try” to lift the X-Wing from the water with full expectation of his failure. The rule of expectations is the first and possibly greatest lesson I learned from The Empire Strikes Back as a nine-year-old. Here, in this scene, that lesson was reinforced in a completely different context. LESSON: To decide to “try” something is to give oneself greater permission to fail than to succeed. Not every lesson I learned from The Empire Strikes Back was entirely positive. For while this line pointed to the truth of humanity being fashioned in God’s image, with many of his divine attributes, it also suggests that (and here is the lesson I nearly took away from this) humanity itself is divine in and of itself…no God necessary. When I recall such moments, I’m now so very glad I was a natural-born skeptic, only half-believing those half-true-whole-false sermons. God used that skepticism to protect me from buying into the counterfeit faith of my youth and to influence me to do the background check to firm up the genuine faith of my adulthood. Today I’ve retained the real wisdom of that Yoda quote — wisdom that is absolutely true: We’re more than just our body. The LESSON here was clear: You must adjust your level of expectation! You’re capable of more than you think! Again, this was a lesson that my then-church twisted to fit its own theology: that positive affirmations of our inner divinity was all that was needed to activate the Christ Consciousness within ourselves, like this one: “I am God; therefore if I name it, I can claim it and if I believe it, I can achieve it! Sadly, while there’s some truth to this rhyme-y cliché, it was taken well out of context both by that liberal denomination and continues to be today in otherwise more orthodox and theologically sound corners. Dream duel with a dark lord. Luke chops Dream Vader's head off a few seconds later. 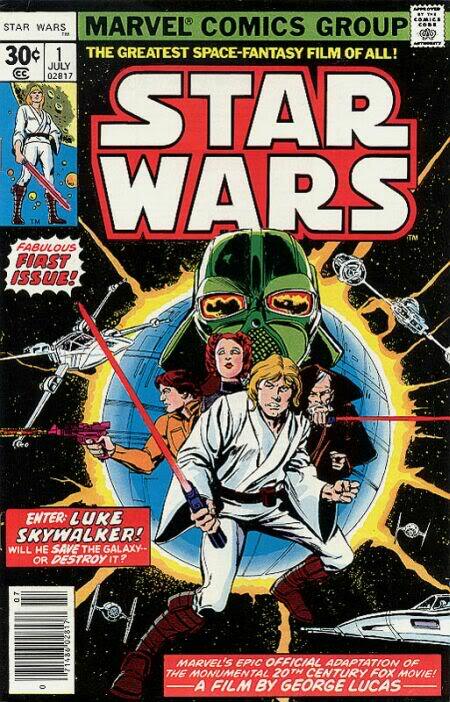 Apparently, this is what that kid was referencing when he “spoiled” the result of Luke and Vader’s duel for me. So when I recognized the scene, I realized there were unknown surprises in store for me in the roughly hour or so remaining in this seminal film. And thus the Rule of Expectations was now in full effect. Next will be a look at Cloud City, the coolest locale in any Star Wars film, and the lessons it had to teach. Look for it! 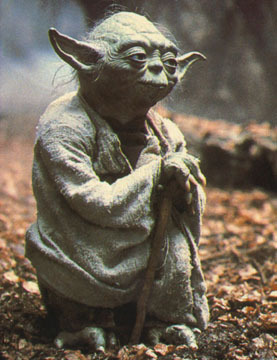 Life Lessons from The Empire Strikes Back [part 5]: Yoda. Those following previous installments of this series will note I’ve changed the title from “Retrospective on The Empire Strikes Back.” That’s because it really is about how this simple piece of fantasy in sci-fi clothing changed my world at age nine, leaving me with impressions and wisdom that have lasted decades later. Hope this mid-stream switch doesn’t throw anyone too badly. I love how the Star Wars saga continually throws us into planets that are all-something. All desert. All mechanical. All arctic. And, in the case of Dagobah, all swamp. "...Why does he sound just like Grover from Sesame Street?" Spoken in a scene where Yoda is still playing the loon, I took note anyway because it seemed so at odds with the Star Wars saga to date. After all, didn’t Luke become great because he’d struck a mighty blow in this galactic war by blowing up the Death Star? I didn’t immediately gain a life lesson from this comment — I was a bit too young, still — but I’ve come to know Yoda is absolutely right. There’s nothing about war that makes a person great. Rather, wars — or, more accurately, the struggle of life — tests the greatness that already exists within a person. Again, in this criticism of his soon-to-be-pupil, Yoda turns a key Star Wars moment — Luke wistfully viewing the Tatooine sunset(s) — upon its ear and challenges both the hero onscreen and the young me in the audience to reconsider my priorities. LESSON LEARNED: Keep your mind on the present. Chilling words. And the LESSON was clear: Shun the evil way. It is absolutely corrupting. Unfortunately, the same scene will show how subtle that evil way can be. Luke takes them anyway. It’s hard to blame him, really. That cave was pretty creepy-looking. But it’s at this moment that Luke truly fails the test. It’s not because he took his fear of the unknown with him in the form of his armaments. It’s that Luke distrusts his mentor, thus cutting himself off from being able to learn from the master. I’d like to say I got this lesson right away. But I didn’t. I recall moments when my father tried to teach me how to swim. He would gently pull me into just deep enough water to see what I could do — and, I suspect, so I could see what I could do. Had I trusted him enough to not let me drown or even struggle much while I learned by doing, I may have learned to swim much sooner than I did. But by insisting on staying in the shallows, I added several years to that learning process. Truthfully, it’s hard to call this a LESSON LEARNED, because I still have problems with this. But the lesson’s plain: Trust your mentors; otherwise, why have them? They may not explain all the whys and wherefores, but they really do know best. We’re not even half done with Yoda. See you next time for more life lessons from the Jedi Master and The Empire Strikes Back. Wow. It’s been less than a week since my last update. This is what working ahead can do for a guy. I confess: At age nine, I didn’t take a single real life lesson from this dynamite sequence. It’s just flat-out awesome, from the fun dialogue/delivery, flawless analog special effects (which thoroughly outshine Lucas’ overdone digital attempt to evoke a similar scene 22 years later in Attack of the Clones), and possibly composer John Williams’ finest single piece of writing. LIFE LESSON: Sometimes it all comes together nicely. Well, OK. Maybe I did glean a little something from this part of the movie, though whether it was something good is very much in question. This is when the bad boy with the golden heart gets the good girl who really kinda wants the bad boy if she can draw out his sensitive side. LESSON LEARNED: Opposites attract. Yes, I first learned this from The Empire Strikes Back. The poor idiot didn’t even know what he was being fired FOR. Bad form, Lord Vader. …to his insistence that the fleet continue to sustain massive losses and damages chasing the tiny Millenium Falcon through the asteroid field, he’s just a pretty terrifying guy to work for. LIFE LESSON: There’s always a bigger fish. As the first great setpiece of the film begins to build up, we’re introduced to the mighty Imperial fleet. 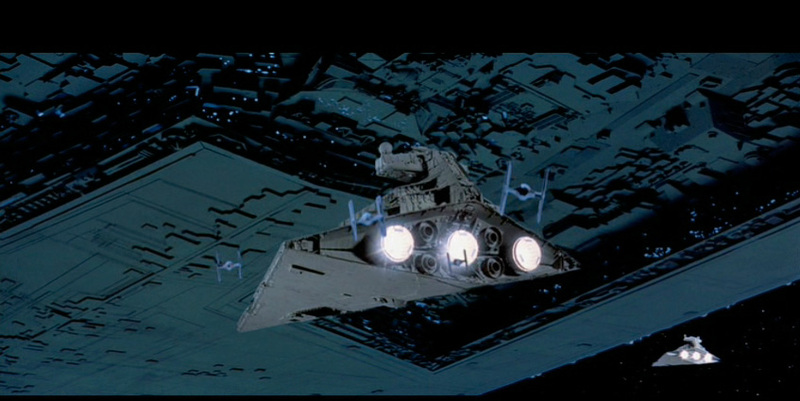 And as a nine-year-old, I found that I was not so impressed with the hugeness of Darth Vader’s flagship, but by the sheer number of TIE Fighters buzzing around with their unique sound effect. You see, we were viewing the film at Phipps Plaza, then perhaps the only theater in 1980 metro Atlanta equipped with Dolby Stereo sound. I loved that I could both see AND hear a TIE fighter moving from left to right on the screen. LESSON LEARNED: Sound matters. This lesson will be immensely reinforced in a climactic scene later in the film. On to the actual battle with the walkers. As I alluded to in the first part of this series, I cannot be sure if it’s just the quality of the work or the tender age at which I first viewed it that makes this whole sequence so engaging three full decades later. Probably it’s both, but I can think of plenty of other nostalgic favorites that haven’t aged well at all, while this film and especially this setpiece continually revives that old thrill. As with so much else in the film, I garnered a few life lessons from this act as well. Though completely outmatched by the Imperial machine, the Rebels find ways to hold the line, however incompletely and unorthodox. And in particular, hero Luke Skywalker doesn’t give up even when he’s been shot down! LESSON LEARNED: Never give up! There’s more than one way to win! Even as this lesson is immediately reinforced by Han’s persistence in getting his rickety ship started, something else that left a lasting impression in the following escape scene is Han Solo putting everything on the line to help the Princess and her annoying droid escape the approaching Darth Vader. Is it wrong to note how badass it is for him to walk in FRONT of his supposed bodyguards? While it’s part of Han’s overall character arc, it was also a powerful lesson to me on loyalty. LESSON LEARNED: Don’t abandon your friends and comrades. Even the bossy girls and whiny robots. Next time: The Asteroid Field. Wow, it’s been over three weeks since my last post in this series. I didn’t intend to let this much time pass on this particular subject. But…I did. So instead of building up to the actual 30th anniversary of my viewing of this seminal film, I find myself resuming it on said anniversary. Yep. Today’s my birthday! It’s a happy one so far, thanks! Memory is a funny thing. The first indelible image I recall from the beginning of the film was not the first image of the Imperial Star Destroyer that opens the film, or the menacing-looking probe droid revealed at the end of the scene, but this super-long-shot of Luke Skywalker riding his Tauntaun on the impossibly snowy planet of Hoth. This was pretty impressive on the biggest screen I'd ever seen in my young life. 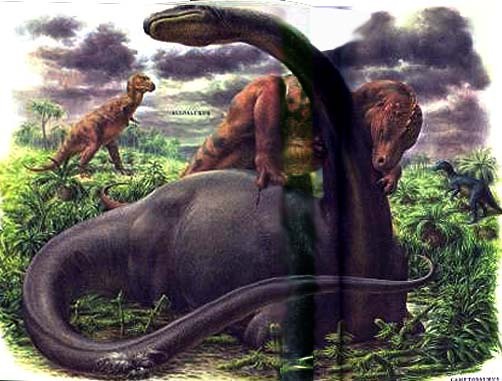 From the Giant Golden Book of Dinosaurs and Other Prehistoric Reptiles, © 1970-something. I LOVED this book as a kid. Luke was riding a dinosaur. In the SNOW. Back then, we figured dinosaurs were scaly, relatively sluggish, cold-blooded creatures, so the thought of a furry dinosaur that could survive in the frigid temperatures was pure fantasy. Thus, with this mere establishing-shot image, I was immediately drawn into a brand-new Star Wars world. The second thing I remember noting from this early scene was composer John Williams’ use of leitmotif as a soft version of the main Star Wars theme — Luke’s theme — comes up as he reveals his face under his scarf. (Leitmotif? It’s a recurrent theme throughout a musical composition associated with a particular person, idea or situation (thanks Apple dictionary :)). 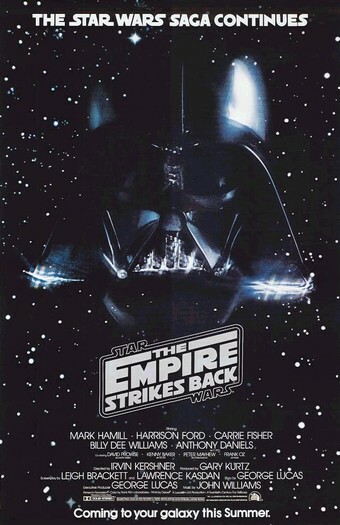 It’s the thing I love most about his wonderful scores and with Empire, Williams really knocked it out the park, using both grand statements like the fun Imperial March he also introduces in the opening frame and very subtle moments like Luke’s theme here. The life lesson I got from these two impressions (though, unlike others I’ll reveal in this series, I didn’t “get” this immediately) is this: The little things that seem relatively insignificant have a greater power than you may recognize at the moment. This is particularly true in art, which is one of my life-long passions. Depending on how the birthday celebrations go today, I may actually do the next part of this series tonight! In any case, I want to cover the film up through the entire Hoth act. Don’t worry; I’m not going to bore you with a frame-by-frame analysis of the film. Hope you’ll stick with me. Drop me a line with your own recollections as I go! Life lessons from The Empire Strikes Back [part 1]: The rule of expectations. The sad truth is that while I steadfastly maintain my claim from this series’ intro, The Empire Strikes Back is still an incomplete movie. That is to say, its effect would likely be entirely lost on me without its predecessor, the original Star Wars. Star Wars was all THE rage on the schoolyard in the fall of 1977…and 1978. And yet I hadn’t seen it. The school I attended (a free-spirited private school that my parents hoped wouldn’t stifle my creative nature like my first-grade public school experience had threatened to) had the Marvel Comic edition collecting the first five issues that I read cover-to-cover over and over again. Star Wars and comics. Two great tastes that went great together. I don’t believe my little brother and I saw Star Wars until either the very end of its theatrical run (when it reached the cheap seats theaters) or during its re-release (there WAS one of those, right?) in 1979. Satisified with these spoilers*, the going-on-nine-years-old Khari is ready for the ultimate triumph of the fair-haired good guy over the ultimate black-clad bad guy when he goes to see The Empire Strikes Back a few weeks later. This little episode, and the experience of seeing Star Wars, highlights the first life lesson I learned from The Empire Strikes Back: expectations have a way of coloring and affecting everything we do or experience. But as I intend to point out, this lesson cannot be applied in isolation from the others. Stick with me as I reminisce further in this series. * Perhaps having seen the original Star Wars with full knowledge of the plot and enjoying it anyway is the reason I pressed for this information. But I’m sure glad that the kid either misremembered or told only half-truth. It’s The Empire Strikes Back. Hands down. I know the fact that I saw it when I did, on my 9th birthday, is a key factor in my making that statement. That’s a formative, imprinting period in a boy’s life…after the parents’ major impact in rearing him are done (and my folks did it well) and before the crucible of adolescence and its potent cocktail of hormones are even getting primed and stoked. It’s when a great — or not-so-great — story can make a difference in a young life. In this case, the story was a great one and the difference was positive. Come with me down memory lane for the next few weeks as I look back on this seminal film.